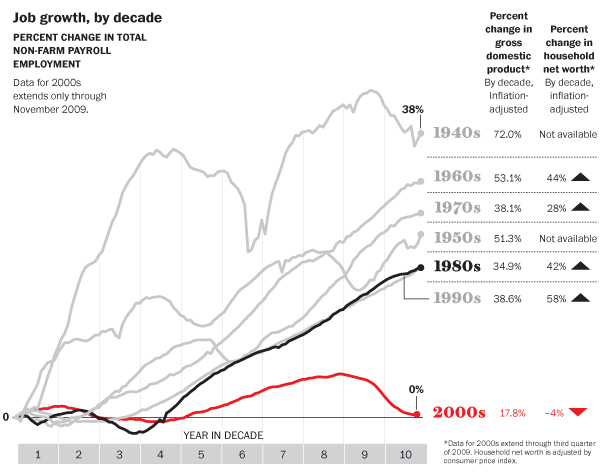 A chart comparing the last seven decades, in terms of economic growth. Now, it should be noted that it's only natural that the 2000's should lie at the bottom of the graph--as our economy has grown larger, the law of big numbers makes huge gains improbable. (That's why the decades come in roughly chronological order in the graph, from top to bottom.) But it's startling to see just how bad things were. The Washington Post makes the point that in the 2000s, two booms weren't enough to overcome two recessions. But what really strikes me about the graph is just how weak-kneed our booms were (seen as the little humps in the graph's 2000s line). At the time, both felt like unprecedented eras of riches and growth--they were covered as such in the media. But comparing them to the growth periods of any other decade makes them look modest at best. To the 2010s! Wait, what's that? Some economists are predicting another lost decade? Aw, crap.